Some sources apparently conflate Harald's "reign" with his entire life. Frontier, Conquest accredits the years 1E 113 to 221 to him (108 years). Both the Daggerfall Chronicles and the 1st Edition Pocket Guide state that he died at the age of 108, placing his birth at 1E 113. The 3rd Edition Pocket Guide states that by 1E 113, "the entirety of modern Skyrim was under the reign of King Harald", suggesting his birth and reign coincided. However, a memorial plaque in Windhelm confirms that his reign began in 1E 143, when he was about 30 years old. Skorm Snow-Strider's Journal indicates "Lord Harald" was in a leadership position, likely as a Jarl, in 1E 139, before he became High King. 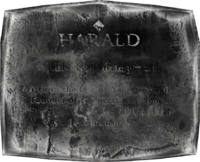 According to Geirmund's Epitaph, Harald's personal battlemage was Archmage of Windhelm, and since Harald was a direct descendant of Ysgramor, who reigned from Windhelm, it is probable Harald was Jarl of Windhelm before becoming High King. Harald bore the Fists of Randagulf, which he said granted him greater strength.